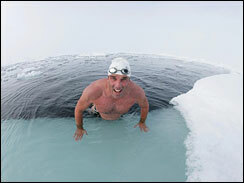 British explorer Lewis Gordon Pugh swam for 18 minutes in 29 degree temperatures at the North Pole on Sunday. He did so in an effort to demonstrate the effects of climate change. “I am obviously ecstatic to have succeeded but this swim is a triumph and a tragedy,” the 37-year-old British lawyer said after coming out of the water. Pugh hopes that his swim will make world leaders pay attention to the issue of climate change, but he will settle for having his balls return to their normal size within the next year.